It is this event that makes Edward decide to pull up stakes and leave her, and Bella just falls to pieces in a giant way. 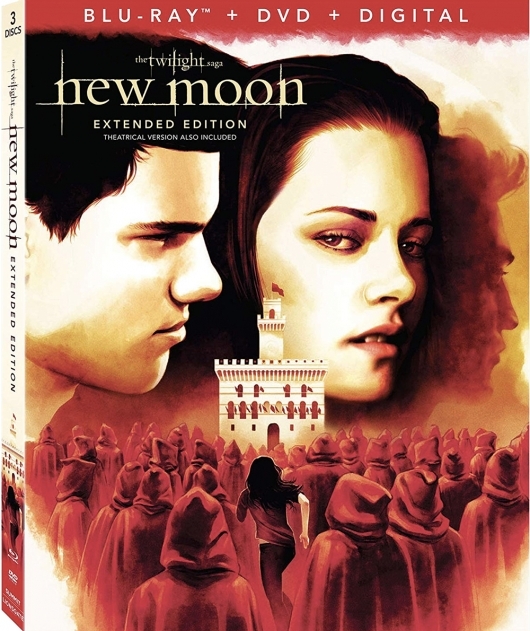 Seasons pass, and nightmares plague Bella until Jacob Black (Taylor Lautner) finally pulls Bella out of it. She starts looking for adrenaline rushes, the only way she can see Edward. She leans on Jacob and his abs, literally, until he pulls away with a secret of his own. He’s a werewolf. Jacob and the pack protect her from Victoria (Rachelle Lefevre), who is still out for revenge on Edward for killing James. Bella decides to cliff dive leading to some wolf CPR, and an Alice (Ashley Greene) vision that makes her think Bella died. Alice (Ashley Greene) shows up and Jacob makes a mess, allowing Edward to think that Bella is dead, causing Edward to go to the Volturi to ask for death. Aro (Michael Sheen) and the Volturi say no because of his gift, but ask him to join them. Edward decides to force the issue by exposing himself to the public. Bella gets there in the nick of time, and they reunite. Unfortunately, the Volturi want to kill her, but are dissuaded when Alice promises to turn her.Edward still doesn’t want to, but is outvoted by the rest of the Cullens (except Rosalie). Bella has to choose Edward over Jacob, after Edward thanks Jacob for his protection of Bella. I’ve always loved the perfect ending of New Moon. Deleted Scenes: Director Chris Weitz introduces the deleted scenes which includes Bella’s birthday cake, Charlie putting Bella to bed, and a bike crash. Interview With the Volturi: Michael Sheen and the other Volturi give their perspectives of their crazy and delightfully deadly characters. We get a nice behind-the-scenes view of a vampire fight. Fandemonium: Twihard mania and the actor’s reactions during their second time at San Diego Comic-Con in 2009. So many cast snippets, and one fan spoke about a walk on role he won. The Beat Goes On: The Music of The Twilight Saga: New Moon: Chris Weitz thought this could be the “greatest break-up mixtape of all time.” So make sure you check THAT out (Hint: One is Band of Skulls). Frame By Frame: Storyboards to Screen: Although this part seems the same for every movie, to me, this is the most interesting part. It always amazes me how etchings can come to such life. Jump To: All of Jacob’s scenes or all of Edward’s scenes. This is very handy if you are Team Jacob or Team Edward exclusively. Extended Scenes: You have the choice of watching the movie straight through on the extended scenes disc or checking out just what was added in pieces in this extended scenes section. – Robert Pattinson’s favorite book is New Moon. – The series changed Taylor Lautner’s opinion on reading. – You get the Cullens AND you get the wolf pack AND you get the Volturi. Exclusive Webcast Events: This is an interesting show from Twilight fan-based websites like Twilight moms, Twilighters Anonymous, and more. 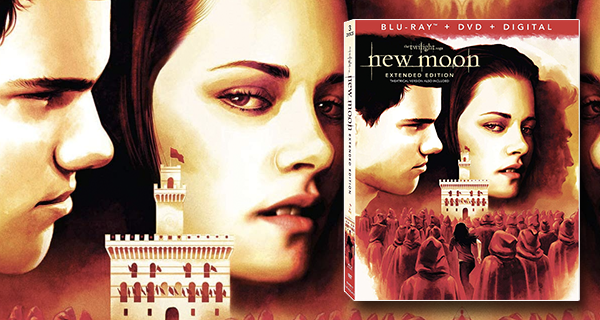 Premiere Red Carpet Interviews: The stars of New Moon look gorgeous. Jamie Campbell Bower is utterly charming. Over 10 hours of special features alone! So much Twilight! Much like my review of the first one, I really did appreciate the movie more this time around.